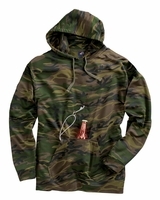 J. America - Tailgate Poly Fleece Hooded Pullover Sweatshirt (8615) 7.0 oz., 100% polyester. Officially licensed and patented HUZU product. Built-in Neoprene beverage holder/security pocket inside front pouch pocket comes with metal bottle/can opener. Camo is an additional $2.00.